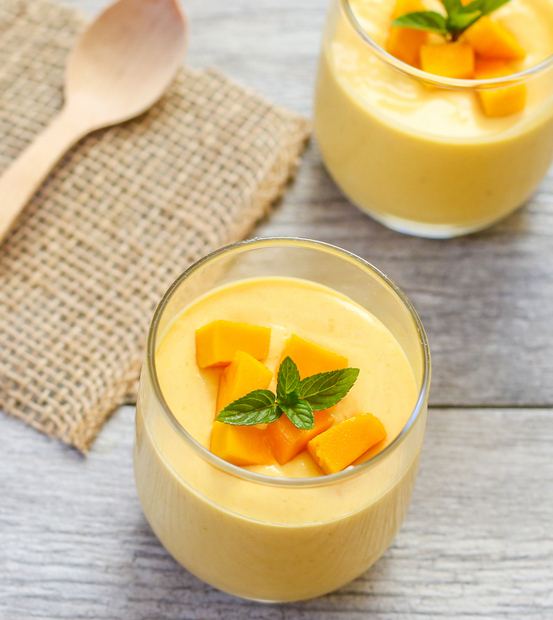 These mango mousse cups are light and airy and not overly sweet, letting the fresh mango puree really shine through. We didn’t have a comic up last week because we were too busy at San Diego Comic Con. We should be back to our regular schedule this week, but until then, here’s a yummy recipe post. Manila mangoes, which are smaller and sweeter than regular mangoes, have been on sale a lot at the Asian grocery stores. It’s always sold by the case, and I can never resist. But then we end up with a case of mangoes and there’s only two of us. 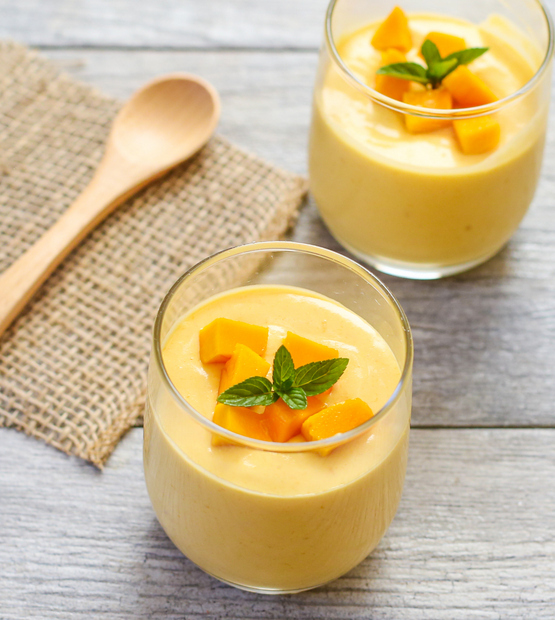 So of course, I need to find other ways to use them, like in this mango mousse. I was able to make a batch ahead of time, and keep them refrigerated. They keep for a few days so we were able to grab a cup out of the fridge whenever the mood strikes us. Dissolve gelatin into 1 tbsp of water. Heat remaining 1 tbsp water until it is hot/almost boiling and add to gelatin, stirring until gelatin is fully dissolved. Add gelatin and puree into blender and mix on high speed until fully blended (taste and see if it needs sugar. if so, add it here and blend again). In a stand mixer, add 2 tbsp sugar and heavy cream and whip on high speed until stiff peaks form. Slowly add puree into the whipped cream, folding it into the cream until completely mixed and uniform in color. Pour into individual portion cups and refrigerate to set. Store uneaten portions in fridge. Very easy to make.Tastes awesome! How long can you make these in advance please? Is it only to the end of the expiry date of the cream They last? If you plan on making these for a party, I would recommend that they be made one day ahead. They will probably keep for about 2-3 days but taste best the first day or the next day. You cant keep them too long because it uses mango puree. Also even if the cream expiration date hasn’t passed, the cream is being exposed and mixed with other ingredients, do it doesn’t last that long either.